So I've been sitting on this one for a couple of days now because B.A. Tortuga is totally one of my favorite authors and I have to admit of all her books that I've read this one has unfortunately turned out to be one of my least favorites. Try as I might it just was not meant to be and I'm pretty sure it's as much me as anything. So I'm not going to spend a lot of time examining things. I'm just going to say that as far as the relationship went I just wasn't feeling it and there was a couple of things that well...quite honestly really annoyed me so for me this one was a bust but not a total loss I very much enjoyed the narrations of Dorian Bane and whatever wasn't working it certainly had nothing to do with the narrator. I'm a fan of gravelly voiced cowboys and truthfully I'm still very much a fan of Ms Tortuga as well...just not this particular story. 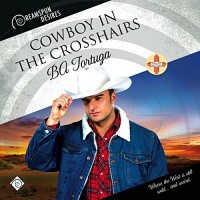 An audio book of 'Cowboy in the Crosshairs' was graciously provided by the publisher in exchange for an honest review.